It’s a shame to come across an artist whose work is not as widely known as some of his other contemporaries and the fact that it took 30 years for the world to discover Clyfford Still’s name. After Still’s death in 1980, all of his work was sealed and shut – nothing was ever exhibited or shown during neither his active years as an artist nor 30 years after his death. His work being shut out from public view is considered to be one of the best kept secrets in the art world. However today we have places like the Clyfford Still Museum in Denver, Colorado which showcase this amazing artist’s unique work. Still was hailed by Jackson Pollock as one of the three men who changed the nature of painting forever. The American abstract painter is considered to be one of the only three other painters who painted within the ‘abstract sublime’ lines. Still himself once said he considered his work so vast that it was ‘un-categorizeable’. 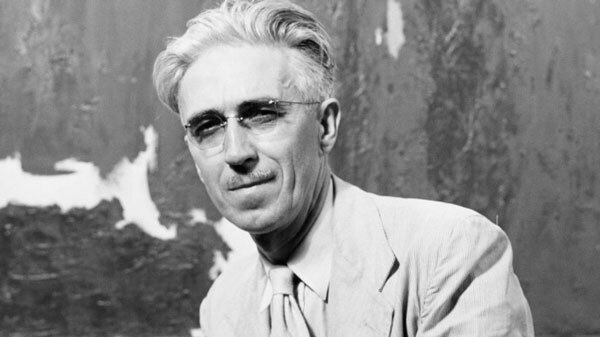 Clyfford Still was born on November 30, 1904 in Grandin, North Dakota and spent much of his childhood moving from one place to another. He studies briefly at the Art Students league in New York, and then later enrolled at Spokane University. The next decade of his life was spent studying art, philosophy and literature at both Spokane and Washington University, the latter to which he returned as a full time professor. Still had no idea that his art would go onto evoke such power into the art world, his paintings had the ability to stare back at the viewer and bore them down. Something Still was never conscious of, in fact for him art was life itself. Still famously stated that for him art represented life, not death and that his paintings represented the merging of both life and death on the canvas. Today art critics state that with Still’s paintings there is almost a magnetic pull associated to them, he draws the viewer in like a strong pull. Such was the power of his work; it was loaded with intensity, delicacy and subtlety. Still was a marvelous innovator which gave him a huge upper hand compared to his contemporaries. Many state that due to his introverted personality that Still was a bit of an outsider, he never showed any of his works during his active years. He refused many one man shows by museums to showcase his works and was deeply upset by the way many establishments had turned the art scene into a political scenario. He often shunned the New York art scene, never read art reviews of anyone else’s works and was very very careful and meticulous in controlling everything related to his paintings including how they were to be sold, collected and exhibited. What is unique about Still’s work is the way the canvas is filled with a vast gulf of dark and deep colors and then there is a distinct flare of light in it somewhere in the middle. Clyfford Still has set an example, both by his work, personality and teachings for many artists’ for generations to come.